Oyama Koma Shopping district (大山こま参道) is a small shopping avenue of Mt. Oyama. It has many gift shops with restaurants. Oyama is popular for its Tofu and Konyaku because of Oyama has pure water. 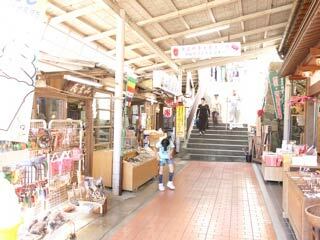 There are lots of shop which sales also the local produces not only food but also the crafts and art works. There are parking. Tofu course is also famous in Oyama. Oyama is also famous for Koma. Koma is Japanese spinning top. Tofu Course at restaurants are cost about 2000 yen to 5000 yen.